I have to say that I am loving all of the tomato love going on – so much so that I think I have had tomatoes in some way, shape or form every single day since Ali and I kicked off our recipe exchange! So far, we have celebrated tomato appetizers, tomato dips and this week we are on to salads and we have a fun BigKitchen Salad Bowl to giveaway this week! I have worked with BigKitchen in the past and they have some great unique kitchen products in their online store! Giveaway details are below the recipe on this post. I think tomatoes are an essential part of any kind of salads and one of my favorite kinds of salads is the classic caprese – tomatoes, fresh mozzarella, fresh basil and a drizzle of tangy balsamic vinegar. 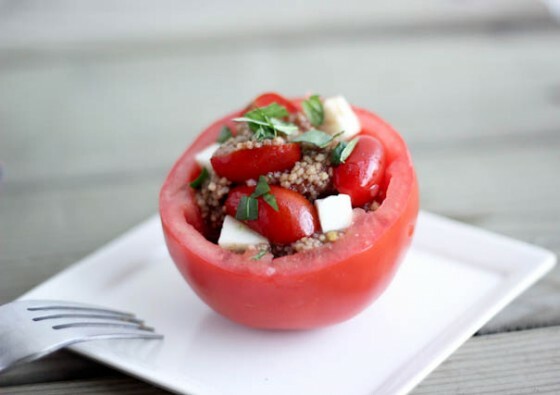 So that’s where my inspiration came for this salad…except I added a little more substance with some whole-wheat couscous and hollowed out some beefsteak tomatoes to serve as the “salad bowls.” I think these would be incredibly fun to serve at a dinner party! As you guys know, we are celebrating tomatoes to share recipes but also to bring awareness to where our food comes from. If you haven’t yet checked out the information that IJM has to offer on their Recipe for Change site, I highly recommend doing so. They have made it very easy to take a stand for this cause: you can sign a petition to get your community supermarkets involved, you can sign up for email updates, you can join their Facebook community or just simply learn more about tomato farming in the US. Annnd, get your soup recipes ready for next week. I am beyond excited to share mine with you! A classic caprese - tomato, basil, fresh mozzarella - salad with couscous and tangy balsamic vinegar, served in hollowed-out tomatoes. A perfect summer salad. Combine the couscous with the water in a small saucepan over medium heat. Bring to a boil, reduce to a simmer, cover and allow the couscous to cook until tender, and all of the water is absorbed. Set aside. While the couscous cooks, slice the tops off of the tomatoes and scoop out the insides of the tomatoes and discard. In a large bowl, combine the grape tomatoes, mozzarella, basil, balsamic vinegar, and olive oil. Add the cooked couscous and stir to combine. Salt and pepper to taste. I ate one of these for dinner on the night that I made them. So with the leftovers, I poured all of the "salad" into a large bowl, chopped the beefsteak tomatoes into 1/2-inch chunks and then stirred it into the rest of the ingredients. I ate it for lunch the following day, and then added some grilled chicken for dinner the following day. There should be enough liquid to keep it cohesive. If not, add balsamic and olive oil, 1 teaspoon at a time, until you reach the consistency you desire. Congratulations to Amy who shared her Grilled Vegetable Salads! 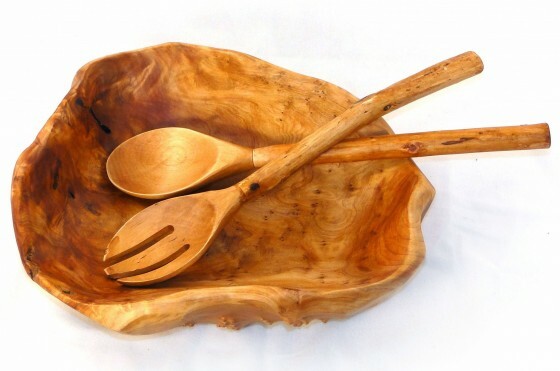 For this week’s giveaway, BigKitchen has provided an Enrico Rootworks Root Wood Large Bowl with Root Servers to hold your next salad. I adore the look of these bowls. They are handcrafted so you know that no two will be the same. Visit BigKitchen Store on the web or Twitter! Write and post a recipe on your blog featuring tomato SALADS. Include the following in your blog post: Come share in the tomato love at the Tomato Love Recipe Exchange, hosted by Gimme Some Oven & Bake Your Day, sponsored this week by BigKitchen Store. Also visit Recipe for Change to learn more about how to support tomato farmers. No blog? Just leave your recipe in the comments section. Add your link to the InLinkz widget below (we have the same widget code, so only add it on one site). Submit your post before Sunday July 29, 11:59pm CST. Anyone can participate in the link up, but the prizes will ship to US addresses only. More detailed info is available here. There are ways to earn additional entries, make sure to come back to this post and leave a comment for each entry that you complete. You can earn up to three additional entries by doing each of the following, but you must leave a comment below saying that you have done so. Pinterest: Pin any image from this post, inviting people to participate in the recipe exchange. Use the #TomatoLove hashtag. Disclaimer: This giveaway is being sponsored by Big Kitchen Store. Contest is open to US residents only. For my full site disclosure, click here. This post contains affiliate links. Mercy, do I love caprese and this is just perfect! These are so cute, what a perfect way to serve couscous! I pinned your tomato cups,and Ali’s salad on my Food For Thought board at Pinterest! I tweeted #tomatlove twitter link above at @writelane ! What a gorgeous bowl! Wow! I added my #tomatolove link above! Thanks for hosting and spreading the word about the tomato farmers plight! This is beautiful! Can’t wait to submit a tomato love recipe this week. Tomato salads are my favorite! What a perfect presentation for summer! These are so creative and just awesome! I’m having so much fun with all of these tomato recipes. I tweeted the contest too. and look at these cups – so cute! love that you used the tomato as the cup! What a clever idea and beautiful presentation! That reminds me of my college years… I used to eat a lot of couscous back then. Anyways, your tomato cups look great! I love stuffed tomatoes! 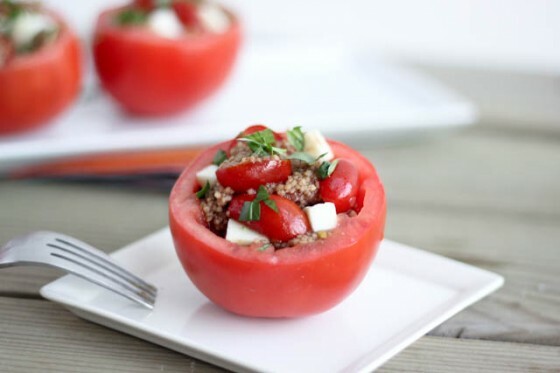 i love all the goodies stuffed into that tomato to make it a cute little bowl of goodness! Ooh, boy. I seem to love anything Caprese…and this looks just fantastic! I love everything about this recipe! Caprese is one of my favorite things ever! Anything in a tomato has to be diving. What a pretty bowl! This is making my mouth water! I love anything with caprese flavors and I love that you included some balsamic vinegar as well! lots of fresh tomatoes, good olive oil, fresh garlic, fresh basil, and some nice salt. It’s as simple as that. Gorgeous! I’m loving each and every one of these #tomatolove recipes! What a great way to enjoy those summer tomatoes! This will be everyone’s favorite! I don’t know anyone who doesn’t like tomatoes and caprese and this looks so pretty as well. Perfect summer appetizers for the parties! I love stuffed tomatoes, but it’s too hot to turn on the oven, so I love your version with raw tomatoes! Can’t wait to try this. i LOVE THIS IDEA!!!! so very much! That bowl is so pretty!! And I am having so much fun these weeks :)) Tweeted and Pinned! I just went back and looked at it, LOVE that you used pesto too! Yes, they are so fun!! This looks so cute, perfect for a summer party! Found you through Kim – wow. This recipe is beautiful. I appreciate all the info on tomatoes. love love love this recipe! Perfect for hosting a summer party! I can’t wait to give this recipe a try! This is a fantastic way to use a tomato!! I would love to pop these in my mouth and experience that flavor burst!! 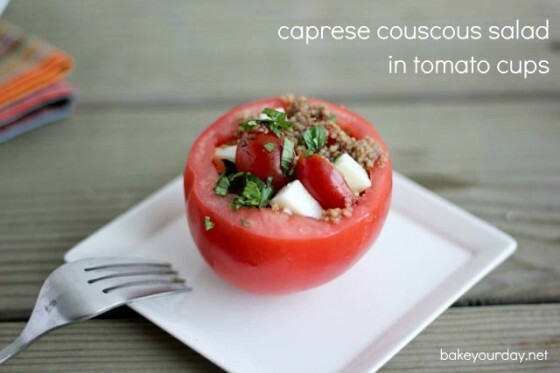 I love your Caprese Couscous Salad in Tomato Cups! The presentation is very creative. I especially like the fresh ingredients (and the vibrant colours!) 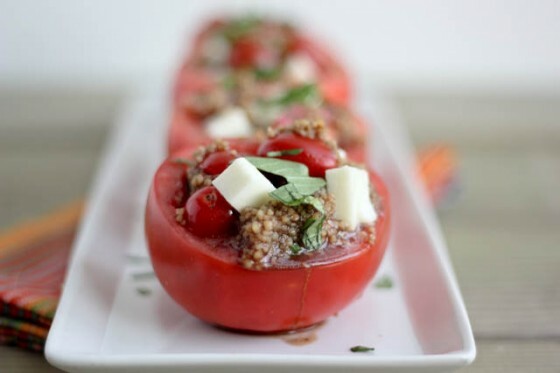 Reminds me of stuffed tomatoes, but better as a summer treat because you don’t have to turn on the oven! Love love LOVE! So cute!!! this sounds absolutely delicious + i’m loving the presentation in the tomato cups. too fun! I just added my cherry tomato, corn and black bean salad to the exchange! Just tweeted about the tomato love exchange party! I shared a photo of my Tomato & Avocado Salad via instagram. Love these tomato cups! I have been loving couscous, and I love anything caprese! Great idea! A great cause and a great recipe Cassie! Love that you have the salad in tomato cups! I love every ingredient in this recipe! great job! Another simple recipe! oh yeah. ©2011-2019 Bake Your Day, LLC. All rights reserved. Bake Your Day by Cassie Laemmli is licensed under a Creative Commons Attribution-NonCommercial-ShareAlike 3.0 United States License.